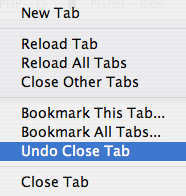 I've been using Firefox 2.0 for most of the day, and so far, I like it. The biggest disappointment is that it doesn't support HttpOnly cookies. Also, a few of my favorite extensions (del.icio.us, Foxylicious, and LiveHTTPHeaders) aren't compatible, but that's a temporary problem. Microsummaries are pretty cool, and I might implement them on my blog. They're basically little summaries that are small enough to fit in a bookmark label. There's also some phishing prevention (which I haven't experimented with yet) and a few other security features, such as support for RFC 3546, which (among other things) extends TLS to allow for host identification, alleviating the shared host problem where the Host header is necessary to figure out which SSL certificate to present, but it's not available until the SSL handshake has completed. For PHP developers, there is a section for web site and application developers with some useful information. What are your first impressions? Have you tried IE 7.0? Note: For the cynics among us, Jeremiah Grossman is soliciting guesses for the first Firefox 2.0 vulnerability.